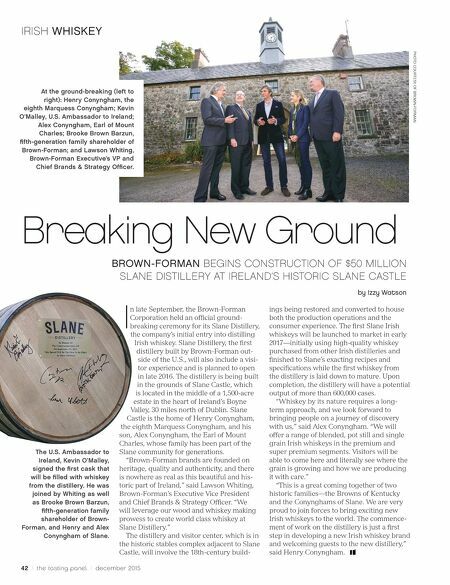 42 / the tasting panel / december 2015 IRISH WHISKEY BROWN-FORMAN BEGINS CONSTRUCTION OF $50 MILLION SLANE DISTILLERY AT IRELAND'S HISTORIC SLANE CASTLE by Izzy Watson Breaking New Ground I n late September, the Brown-Forman Corporation held an official ground- breaking ceremony for its Slane Distillery, the company's initial entry into distilling Irish whiskey. Slane Distillery, the first distillery built by Brown-Forman out- side of the U.S., will also include a visi- tor experience and is planned to open in late 2016. The distillery is being built in the grounds of Slane Castle, which is located in the middle of a 1,500-acre estate in the heart of Ireland's Boyne Valley, 30 miles north of Dublin. Slane Castle is the home of Henry Conyngham, the eighth Marquess Conyngham, and his son, Alex Conyngham, the Earl of Mount Charles, whose family has been part of the Slane community for generations. "Brown-Forman brands are founded on heritage, quality and authenticity, and there is nowhere as real as this beautiful and his- toric part of Ireland," said Lawson Whiting, Brown-Forman's Executive Vice President and Chief Brands & Strategy Officer. "We will leverage our wood and whiskey making prowess to create world class whiskey at Slane Distillery." The distillery and visitor center, which is in the historic stables complex adjacent to Slane Castle, will involve the 18th-century build- ings being restored and converted to house both the production operations and the consumer experience. The first Slane Irish whiskeys will be launched to market in early 2017—initially using high-quality whiskey purchased from other Irish distilleries and finished to Slane's exacting recipes and specifications while the first whiskey from the distillery is laid down to mature. Upon completion, the distillery will have a potential output of more than 600,000 cases. "Whiskey by its nature requires a long- term approach, and we look forward to bringing people on a journey of discovery with us," said Alex Conyngham. "We will offer a range of blended, pot still and single grain Irish whiskeys in the premium and super premium segments. Visitors will be able to come here and literally see where the grain is growing and how we are producing it with care." "This is a great coming together of two historic families—the Browns of Kentucky and the Conynghams of Slane. We are very proud to join forces to bring exciting new Irish whiskeys to the world. The commence- ment of work on the distillery is just a first step in developing a new Irish whiskey brand and welcoming guests to the new distillery," said Henry Conyngham. 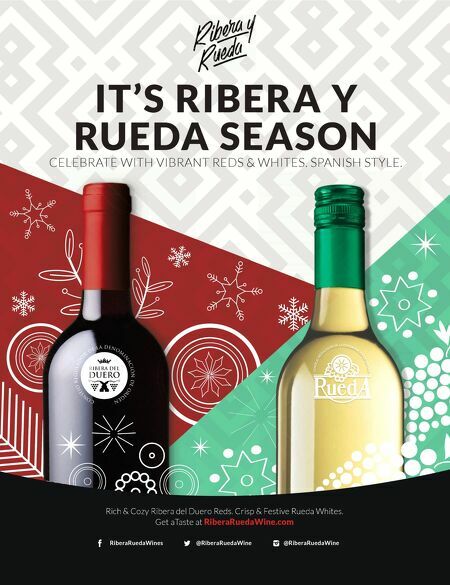 PHOTO COURTESY OF BROWN-FORMAN The U.S. Ambassador to Ireland, Kevin O'Malley, signed the first cask that will be filled with whiskey from the distillery. He was joined by Whiting as well as Brooke Brown Barzun, fifth-generation family shareholder of Brown- Forman, and Henry and Alex Conyngham of Slane. At the ground-breaking (left to right): Henry Conyngham, the eighth Marquess Conyngham; Kevin O'Malley, U.S. Ambassador to Ireland; Alex Conyngham, Earl of Mount Charles; Brooke Brown Barzun, fifth-generation family shareholder of Brown-Forman; and Lawson Whiting, Brown-Forman Executive's VP and Chief Brands & Strategy Officer.